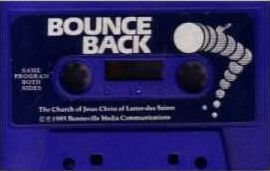 In 1985, the Church of Jesus Christ of Latter-day Saints released a short cassette tape that focused on helping people with feeling positive. The twenty-minute tape was a creative presentation of the idea that "disappointment is an unavoidable fact of life," but that "it can aslo be full, and rich and wonderful, if you don't let the bad times rob you of hope." "There are lots of ways to deal with disappointment, overcome problems and bounce back from the hard times. And there are lots of ways to find the hope that you need to carry on. This tape is a collection of thoughts, ideas and music that can help you bounce back." I've enjoyed this tape for years, and thought it would be a good idea to share the transcript (taken from the inner flap) of the message with anyone else who might find it helpful. Don't put your life on hold waiting for your hopes and dreams to come true. Just because life has "cheated" you out of something doesn't mean you have an excuse for not living up to your potential. fThe way you look at a situation has a lot to do with how you respond to it. It's the old question of whether the glass is half full or half empty. A little creative thinking and a concious effort to see things in a positive way can turn things around. The ordinary becomes the extraordinary. A stumbling block becomes a stepping stone. The Church of Jesus Christ of Latter-day Saints recently created a new website called Provident Living. Among other things, there's section on Social and Emotional Strength. Some of the issues covered are topics such as self-esteem and self-worth, anxiety, depression, stress management, suicide, and many more. For other Church products, visit the Online Distribution Center. Bounce Back is currently out of print.